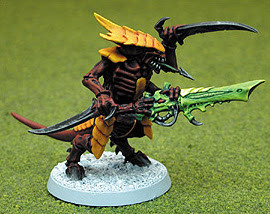 I've spent a bit of time pondering about a paint scheme for the 'Nids. I considered schemes inspired by the natural world, specifially beetles. I liked the idea of a metallic sheen on the armour plates that bugs have. I baulked at this on the grounds that with my limited skill, they would end up looking like my Necrons! I also thought about a camouflage paint scheme, but discarded this also purely on the grounds that camouflage is for defence or for sneaks. Apart from Lictors, I figure 'Nids are as subtle as a sledgehammer - so bold colours it was going to be. By chance I came across the results of the US GW painting competition for Tyranid Warriors - here. Nick Marchetti's entry leapt out at me (Page 3) so this is what I currently aiming for. I've reproduced the competition image here, so I can retain it when it eventually gets removed from the GW website. Original competition page is linked above.